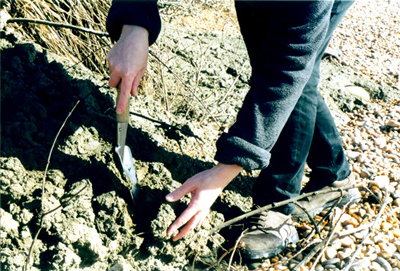 Experimenting with earth as colour found in the landscape has been a continuing source of inquiry in my work since 1994. Exploring mostly in the British Isles, I collect and record different coloured clays, ores and sands occurring in specific locations. 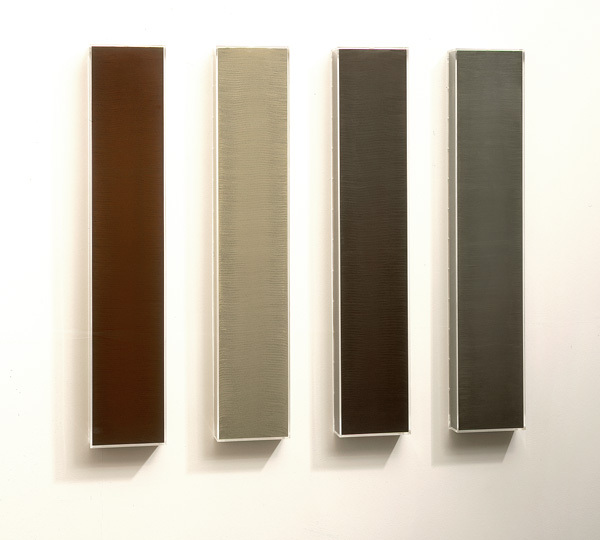 These works are concerned with exploring physical colour, as it exists naturally. 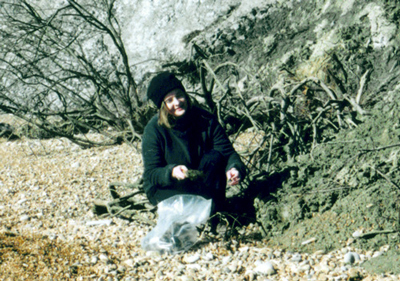 Collecting clay at Golden Cap, Dorset : February 2004 Different colours tend to be found close to each other, and I often make the earthworks in series relating to this. Recording when each clay or sand is collected and where is also of importance, as the cliffs can change quite dramatically over the years and some strata disappear for a while. Much of the sand and clay which I collect comes from coastal areas, where the cliffs have recently collapsed onto the beach. I often explore the beaches in winter, only collecting earth when there is noticeable subsidence but before the sea has washed this away. Disused quarries are also a source of materials, particularly of metal ores. The earth is broken up by hand and then ground with various pestles and mortars. This process takes much longer for the clays or sandstones and relatively little time for the sands. The clays, when poured, form quite differentiated strata of very fine powder up to many large particles - whereas the sands form relatively subtle strata of more evenly sized particles. There is a balance between the relatively uncontrollable experience of watching material fall and the enjoyment of observing idiosyncrasies in the resulting cross-sections of the pouring process. The repetitive nature of the pouring process records time passing physically - it is also a process of physical meditation.